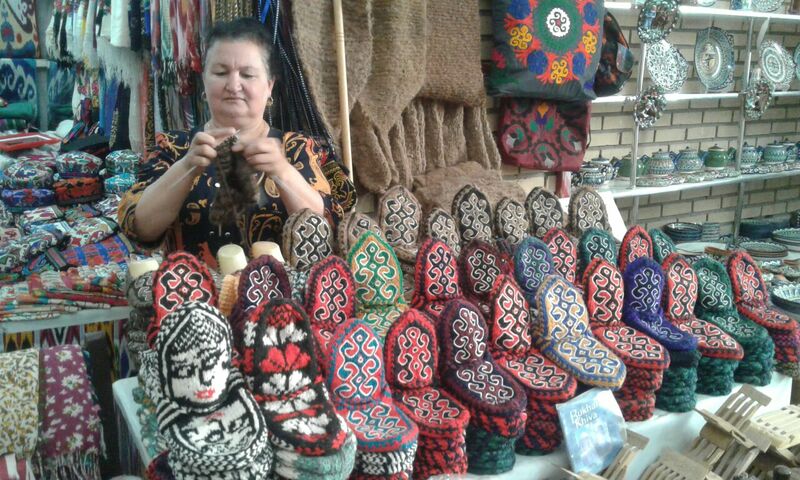 There are many beautiful applied art objects to purchase in Uzbekistan: suzane, ceramics, ikat fabrics, carpets and more. But sometimes it is the simple souvenir that is the most pleasing. 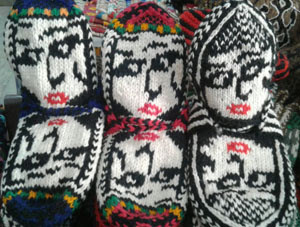 Only in Khiva, in western Uzbekistan, can you buy these wonderful, knitted *face* socks. A cosy, perfect present for a shoes-free household or yoga friends. (Very occasionally you may also find *face* mittens). Everywhere in Khiva you see women knitting - either socks with traditional Khorezm patterns or these face socks. (Khorezm is the vast, historical region in which Khiva is located). 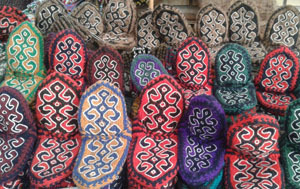 Uzbek Journeys traveller, Robin Gurr, gave a pair to her friend, embroiderer and knitter Jillian Dellit. Jillian absolutely loved them and, after many wears, was alarmed when holes started to appear on both heels. Drawing on the skills of her mother and grandmother, Jillian mended them. And if the same should happen to your lovely face socks, you can follow Jillian's illustrated repair techniques on her blog Always Stitching.